Settle yourself into some of our favourite pieces of sportswriting from this week. 1. Zermeño had seen what had happened to an earlier LeBron mural in Venice. In early July, a portrait of James backed by the words “The King of LA” was painted behind Baby Blues BBQ. In a matter of days, someone had vandalized it with barbs aimed at the Lakers’ newest signee. We don’t want you. LeFraud. 3-6. No King. Jonas Never, who made the mural with Fernando Valdez, fixed the mural and removed the “of” to appease fans. Writing in The Ringer, Paulo Uggetti looks at how LeBron James is being received by locals in Los Angeles and how his arrival to the Lakers is affecting Kobe Bryant fans. 2. Ironically, the other owners remind me of the hipster who got a Japanese character tattooed on his neck thinking it said loyalty. but it actually said noodles. They think they’re showing strength, patriotism, and soothing ruffled fan feathers – but they’re actually saying noodles. To deny players the right to express their frustration in a peaceful manner is a disgrace to the Constitution, the opposite of patriotism. By compromising ethics to economy, you show moral weakness. And if you think you’re appealing to your fan base, you might be doing the opposite. Kareem Abdul-Jabbar writes an open letter to the NFL owners in The Guardian about his take on athletes being denied the right to express dissent in a peaceful manner. 3. It seems baffling that these particular executives have failed to monetise Mourinho with some sort of fly‑on-the-wall reality series, particularly now the window may be rapidly closing. For all their postmodernist bluster, perhaps, United’s top brass are still some way behind the proper monsters of unscripted television…. Something for Woodward and Arnold to bear in mind on their eternal quest to take things to “the next level” commercially. If rushed into production now, an unscripted reality Mourinho series would certainly have the ability to reach beyond the product’s existing customer base, or “Manchester United supporters” as they used to be known. Call it Keeping Up With The KarKrashing One – and give us at least three weeks of unmissable histrionics before its star walks out. Marina Hyde hitting the nail on the head once again writing in The Guardian. She suggests that Jose Mourinho’s dramatics would be perfect for a fly-on-the-wall reality series. 4. For Froome, losing this year’s Tour is more likely the result of an unusual confluence of circumstances than the end of his reign of dominance. Even if it is, Froome is merely the greatest cog in the operation, not the operation itself. If he fades, Thomas will pick up the mantle, or else Bernal or some other youngster will. Froome, it turns out, is mortal. Sky is untouchable. In the Ringer, Michael Baumann reflects on Team Sky’s dominance in the Tour de France. I still stand by my belief that a sweeper will not win you an All-Ireland. I accept that Clare scored 0-25 in an hour’s hurling playing a sweeper on Saturday, which might contradict what I’ve always said about it – ie, that you fundamentally curtail your scoring power by playing with five forwards. But I just think the circumstances of that game on Saturday won’t be replicated. Jackie Tyrrell looks back at the epic All-Ireland SHC semi-final between Galway and Clare in the Irish Times and discusses the role of the sweeper as the sides prepare to do battle again today. 6. Substitutes in green delivered 2-6 of the final total; Cork’s just 0-1. And the stardust man was a near-forgotten one, Shane Dowling in from the 57th minute and chasing destiny like a one-man wrecking-ball. None of this might have mattered mind, but for Nickie Quaid’s intervention with the sides level and the game deep in injury-time. Seamus Harnedy must have felt like a seagull had swooped on his house keys. “Incredible, wasn’t it,” smiled [John] Kiely of the miracle theft. 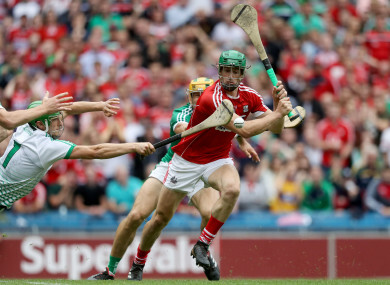 The Irish Independent’s Vincent Hogan describes that incredible flick-save from Limerick goalkeeper Nickie Quaid against Cork in the other All-Ireland SHC semi-final. Email “Seagulls swiping Séamus Harnedy's house keys and more of the week's best sportswriting”. Feedback on “Seagulls swiping Séamus Harnedy's house keys and more of the week's best sportswriting”.